It’s rare that I get a cookbook and am instantly so incredibly inspired by it, I can’t wait to make something. Masala and Meatballs is just that. A gorgeous compilation of accessible Indian dishes made easy and approachable for the standard American. 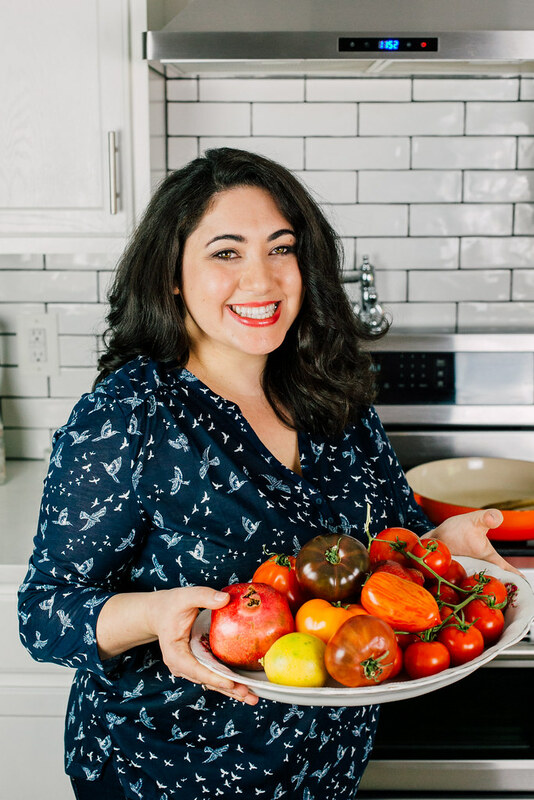 Asha is the author and blogger at Food Fashion Party and her new cookbook is loaded stunning photos and recipes and I was finding myself “dog-earing” almost every single recipe. Spinach fritters, spiced eggplant bruschetta and almond curry are just a few things on my “I can’t wait to make this” list. I finally settled on a play off of Asha’s naan pizzas. She has a recipe for both homemade naan (wow..easier than I thought) and another to use them for easy to make pizzas. Mostly vegetarian recipes in the book, the naan pizza was made with chicken and for some reason I was craving vegetables. 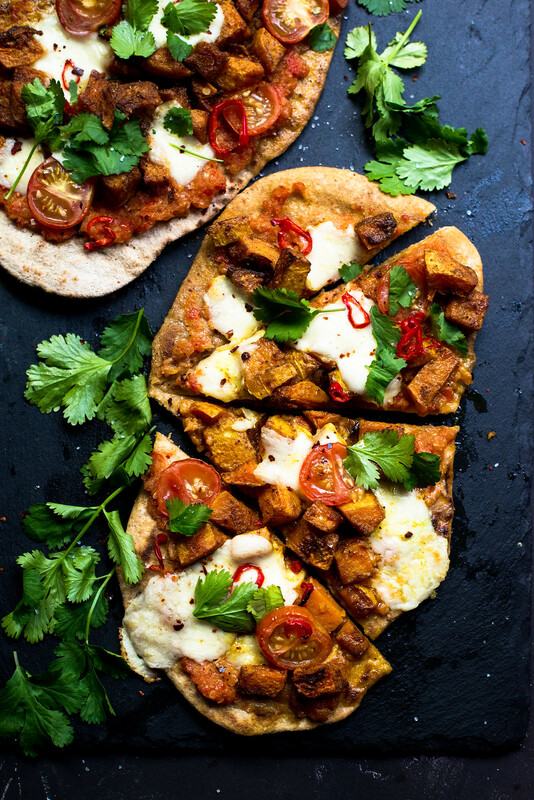 I substitute cubed butternut squash for the chicken, using all the same spices and topped the naan pizzas with Indian spiced butternut squash, extra garlicky tomato sauce and lots of mozzarella cheese and more fresh aromatics. The flavors were incredible, blending cultures and still respecting the robust spices and Indian flavors. The homemade naan is incredibly easy to make, though took a bit longer than I thought it would. That could be user error though. No yeast is involved, just a bowl and a sturdy wooden spoon. It makes a good amount of dough, and when cooking each naan on a single cast iron skillet, that what was the time consuming part. Next time I make this, I’ll save it for summer and grill it outside! Then, make the naan. In a bowl, combine the yogurt, baking powder and 1/3 cup of the warm water. Stir to combine and set aside. In another large bowl, combine the 2 flours, baking soda and salt and stir in the yogurt mixture and remaining water, adding it in a little at a time until a dough forms. Turn dough onto a lightly floured surface and continue mixing with your hands until a round dough forms. Then place it in a clean oiled bowl and cover it with a towel and set aside. While dough rests, toss the cubed butternut squash on a baking sheet with spices and olive oil. Arrange in a single layer and roast until fork tender, for about 35-40 minutes. Once done, remove from oven and set aside. To make the tomato sauce, add all ingredients to a blender or food processor and puree until smooth. Transfer to a small pot and cook tomato sauce for about 10-12 minutes so it has reduced some of its liquid. Set aside. After dough has rested, knead it for a few more minutes and then let it rest. Divide dough into 8 pieces and roll it into a small ball then using a lightly floured rolling pin, roll out the dough to about a 8-10 inch oblong shape. Heat a large cast iron skillet on high and cook naan on each side for about 1-2 minutes. The bread should lightly turn golden brown with a few bubbles. To assemble the naan pizzas, take 4 of the naans and spread tomato mixture onto all of them. Top pizzas with butternut squash, torn mozzarella cheese and sliced chili's. Bake naan pizzas until cheese has melted. Remove from oven and garnish with fresh cilantro. Recipe adapted from Masala & Meatballs cookbook. Naan recipe makes 8 naan. This pizza is healthier as we are used to eat. Never tried Indian food before but I am sure I will make this pizza, thanks for your recipe. It is a fun twist!! Butternut squash pizza is one of my favorite dishes to make – Love your twist with the naan! Thank you Kimberly!!! Obsessed with anything butternut! !